The hype over the internet of things has reached big data levels, as has the idealism. It’s not enough that major corporate conglomerates are predicting savings of trillions of dollars in operating costs from the mix of connected devices, data analytics and automation. Consumers are also rushing to purchase connected activity monitors, automated door locks and thermostats that come with their own algorithm. But as data from a survey conducted by ARM and the Economist’s Intelligence Unit shows, the promise of the internet of things so far is just that — promise. 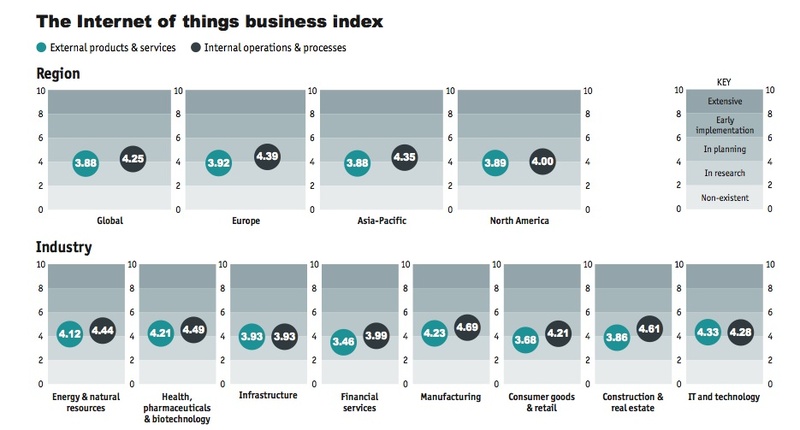 And in fact, the most interesting numbers coming out of this data are the charts that show that all industries are pretty much on the same page with regard to IoT — the “looking into it” stage — and that most businesses are unsure what to do with this emerging set of technologies. Meanwhile, the data offers one hell of a cautionary tale. It’s not enough to put connectivity into things; companies will have to embrace the broader notion of connectivity outside their walls if the internet of things is actually supposed to become a true internet, where many networks connect and data is exchanged. These findings fit with recent announcements from companies like GE, Splunk Cisco and Intel. Businesses are aware that connecting devices and analyzing data can make a difference in how they operate, but they aren’t sure what that difference will be. It might be the obvious savings from optimizing a scarce resource like limited parking spaces or optimizing the mechanical function of an engine or data center based on new information. But when it comes to the greater promise of IoT, changing a business from one of selling products to selling a service or offering a customer new products that are more profitable — companies are struggling to figure it out. For example, a company that used to sell kitchen monitoring software to restaurants, could with sensors offer a service that notifies restaurants that the fridge is failing. Yet, the ARM data shows that many companies are so stymied by the implementation of connected systems that they are barely getting to the first stage of optimization. Ian Ferguson, the VP Segment Marketing at ARM, pointed out that ARM’s experiments with connectivity required a lot of integration and effort from highly technical staff. This isn’t like rolling out a SaaS based product Salesforce, it’s closer to the integration levels of old-school ERP systems like Oracle. And unlike the hyped-up narrative — in which your delivery truck is talking to the electrical grid which is talking to your smart meter — these corporate systems will start out closed. A simple example of one of these “walled gardens”, according to Mr Ashton, is employee office passes or ID badges, many of which are fitted with radio-frequency identification (RFID) tags. Swiping an ID card will get an employee into his or her workplace, but he will still have to fill out a form or wear an identity sticker when visiting a different office building. A common network between landlords could eliminate this inefficiency as well as create a much richer data set on employee whereabouts. “What we have right now is a lot of IoT-type technology that is heavy on things and light on Internet. That’s the bit that needs to change,” he says. 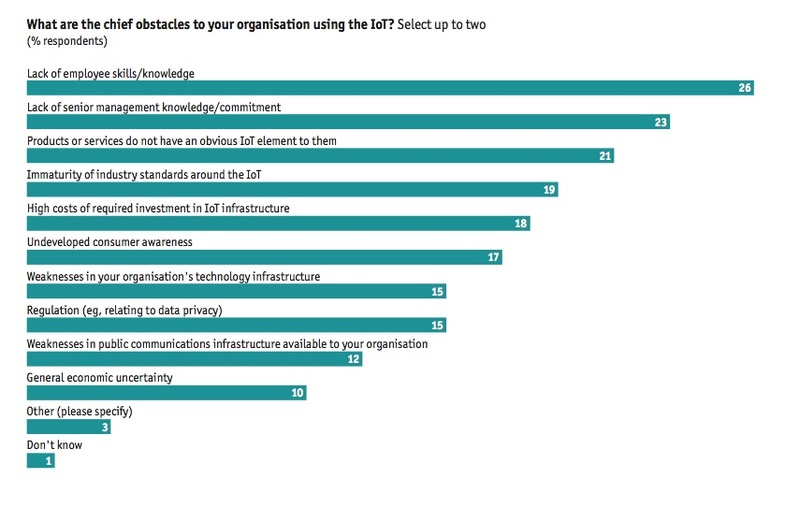 The ARM report doesn’t delve too much into this, but it’s worth also looking at the consumer experience for the internet of things, if only because the executives surveyed for this report believe that a lack of consumer awareness is hindering investment. My hunch is that consumers will purchase ever more connected gadgets without necessarily understanding the value of even more connectedness. For example, a Nest thermostat is a great example of a connected device offering value by itself, but when combined with other sensors or married to the electric grid it becomes a far more powerful tool. As these devices hop on our Wi-Fi networks and multiple apps crowd our phones, its unclear if worries about data privacy or frustration with such intrusive technologies will cause a consumer backlash. The report indicated that executives think privacy might be the problem, with three in five respondents agreeing that lack of trust and concerns about data privacy are hampering consumer uptake of the IoT. 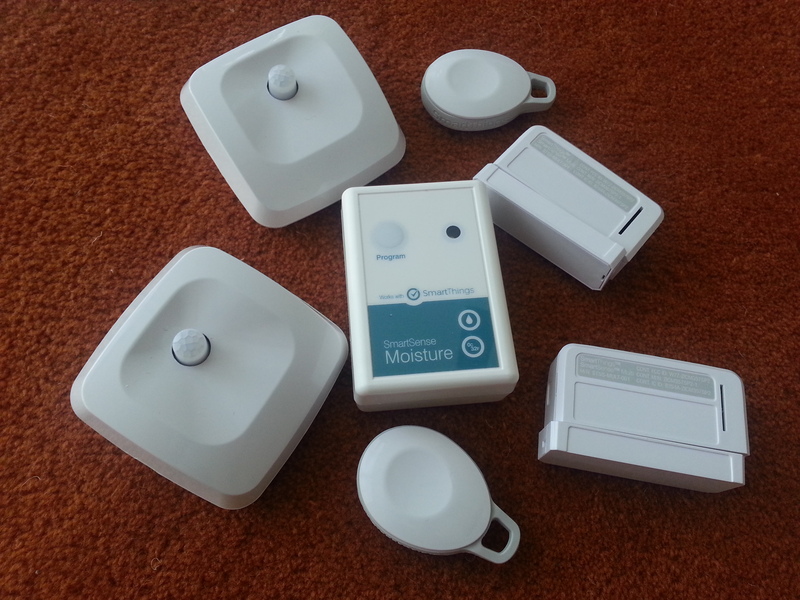 A pile of sensors from SmartThings. But as businesses work to embed connectivity into their manufacturing floors and their buildings, I think the user experience backlash might be sooner in coming. In the office the IoT deployment effort is around embedding connectivity as opposed to building a plastic-encased device and app that the employee must interact with. Thanks to integration efforts and planning, employees at work will experience the internet of things as something that is tangential to their normal office life, as opposed to something they have to think about every time they pull out their smartphone to turn on a light. Sure, they will have the benefit of knowing the moment a conference room becomes available or a cubicle that can adjust to their preferred temperatures, but they won’t have to implement or even see those systems, like they will at home. Businesses are taking the lessons taught by the consumerization of IT, and are pushing a user-centric focus on design and a experience. Because businesses have money to spend and can focus on integration, my hunch is that adoption there will be greater to begin with. Business models will be clearer and worries about privacy will be lessened. On the consumer side, the kludgey UI, piecemeal approaches and uncertainty about what a company might do with your data may cause the internet of things to stutter a bit. So for now, there’s going to be a tale of two connected networks, and businesses will be the main character.